ecoFinish. Outstanding In The Field. These eight steel panels are wearing ecoFinish's aquaBright pool finish that was applied in the fall of 2013. These panels were left outside to endure the extreme elements of one of the worst winters on record here in Ottawa, Ontario Canada. The panels experienced a low of - 36 C with a wind chill of - 42 and, were subject to rain, freezing rain, ice pellets, sleet and four feet of snow at any given time since November 2013. These fiberglass steps were finished to show the 'before and after' aquaBright effect; the steps experienced the same harsh treatment and were left out in the cold this winter. Both the steel panels and the fiberglass steps sprayed with aquaBright survived the extreme conditions without a blemish. No other pool finish can flex like aquaBright in sub-zero temperatures. Click on the photo to see more colours. aquaBright was developed by ecoFinish. aquaBright is a multiplex powder comprised of modified acrylic resins specially designed to work with our patented spray system. 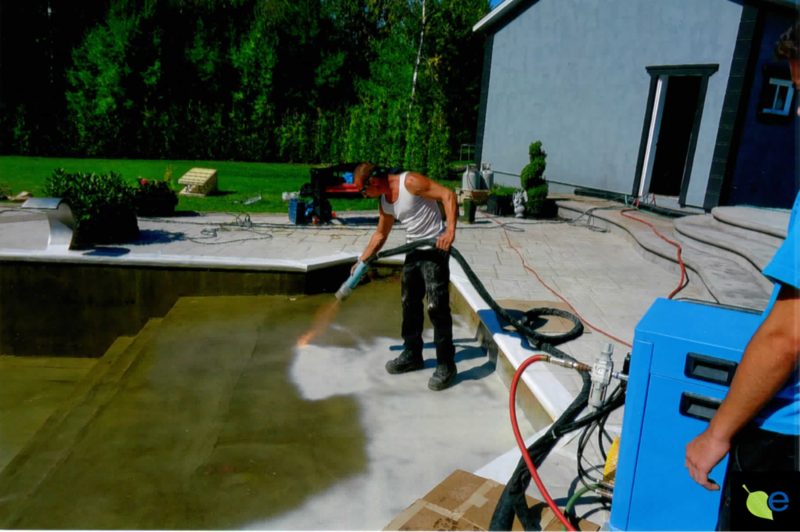 aquaBright is a thermoplastic pool coating that is pneumatically applied to aluminum, steel fiberglass, concrete and cementitious surfaces to form a permanent finish. aquaBright bonds easily to form a smooth and continuous cured film. aquaBright has many benefits over traditional swimming pool paint and plaster because it requires less time and labour to install, less chemicals to maintain and more time to enjoy. first flock coat impales aquaBright into epoxy for excellent adherence. Click to Find out How to Become an Installer. ecoFinish's aquaBright is the perfect interior and exterior swimming pool and spa finish choice. Designed for new build residential and commercial projects or, as a renovation specialists best tool for success in the restoration business. There is no special chemical start up procedures, no need to dilute your chemicals, and no long curing times; just add your chemicals and enjoy!